Before the success of “A Song Of Ice And Fire” George R.R. Martin was primarily known as a short-story writer, producing dozens of stories of a consistently high quality including several award winners. They have been collected multiple times in various short-story collections, the definitive collection being the impressive "Dreamsongs" (also known as "G.R.R.M. : The RRetrospective") which collects the best of three decades worth of short stories. “Songs Of Stars And Shadows” is one of the earliest of the (out-of-print) short story collections. It is a compilation of a dozen or so stories written during the late 1970s. It starts off with “This Tower Of Ashes”, a story narrated by a lonely man who lives in an abandoned tower, built by an ancient civilisation. He makes his living from the surrounding forest, a wilderness populated by giant spiders whose venom makes their victims hallucinate. When his ex-girlfriend visits with her new husband, he takes them on an ill-advised trip into the forest, in a doomed attempt to impress her. It's quite a slight story in terms of plot, although it does have a nice twist at the end, but it is very well written. 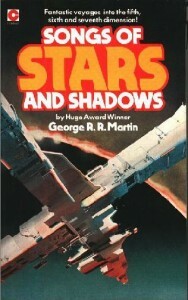 The last story in the collection, “And Seven Times Never Kill Man”, is the other stand-out story in the book and was Martin’s first work to be nominated for the Hugo Award. It tells of a trader in alien artefacts who lives on a planet inhabited by a peaceful and enigmatic non-human race who worship the mysterious metallic pyramids they build their settlements around. The peace is shattered by the arrival of a militaristic religious cult, who claim increasingly large sections of the alien's land as they try to colonise the planet. The trader tries to organise the aliens to fight back, but they seem largely indifferent to the threat. This is an excellent story, the aliens are interesting and original, it’s well-written and it has a very effective ending. Most of the other stories in the book are of consistently good quality. “The Lonely Songs of Laren Dorr” is a short but memorable fantasy story, about a woman who travels between worlds, running from powerful supernatural enemies. She comes to a vast planet with a single inhabitant, the Laren Dorr of the title, who is imprisoned there, and tries to persuade her to stay with him. “Night of the Vampyres” is a fairly standard tale of a near-future revolution in the USA, with a group of laser-armed fighter pilots thrust into the middle of the conflict. “... For A Single Yesterday” is a wistful tale of a post-apocalyptic future, focusing on a group of survivors, some of whom focus on the past more than is healthy. “Men of Greywater Station” (co-written with Howard Waldrop) is a claustrophobic tale of a group of scientists trapped on a world with hostile alien life that is capable of controlling humans. They are reasonably safe in their camp, but it’s a long wait until a rescue team can fight its way through a hostile wilderness. Like many of the stories in the collection there's an effective twist at the end. “The Runners” is another example of this, a man is on the run from a mysterious group of strangers, and he enlists a telepath to tell him why he is being chased. However, the answer is not what he – or the telepath expects. The remaining stories are relatively insignificant – the whimsical “Patrick Henry, Jupiter and the Little Red Brick Spaceship” and “Night Shift” which attempts to be a gritty and realistic Science Fiction tale but forgets to include an interesting plot. In summary, this is a good collection of short stories, most of which are well worth reading even if only “And Seven Times Never Kill Man” would be ranked amongst Martin’s best short fiction. English is not my first language so i’d like to ask you a question about one of the stories you described. ‘…and seven times never kill a man’. I didn’t get the ending. Did the angels kill their own ? if so why? also were the furry inhabitants telepathic? I think the Angels did indeed kill their own. The story is a bit vague about what exactly happened, but it does appears that the Angels have somehow come under the influence of the alien religion. It may well be that telepathy is key to how the alien religion works.